Please do not bring your child to school earlier than the opening time of 8:30 AM. The doors will be locked before this time. We would greatly appreciate it if all children were in the classroom by the start of circle time. Late arrival to school can be disruptive. Note that you are responsible for your child and his/her siblings until you leave the classroom. In order to ensure the safety of your child upon dismissal from school, only authorized persons will be allowed to pick up your child. At the time of enrollment, parents will be sent a dismissal card, which must be filled out and returned by the first day of school. Please write the names of all people whom you give permission to pick your child up from school. Children will not be released to anyone whose name does not appear on the card. Until we are able to recognize everyone by sight, you may be asked to show identification. Car pool drivers should be listed on the card. We get to know your personal dismissal routine and the people who are cleared to pick up, but please be sure to mention any changes in your dismissal schedule so we know who to expect. Please be on time picking up your child. Dismissal time is 12:30 daily. If you know you are going to be detained, please call the school immediately so we can reassure your child. An additional fee of $10 will be charged for consistent tardiness during pickup time. We dismiss each child individually or by car pool. Wait in the hallway until your child leaves the classroom. This helps us keep a close eye on the children leaving the room. Please teach your children to STOP at the end of the ramp and hold your hand while crossing the parking lot- it can be busy! Parent conferences will be held in the Spring. At this time, the head teacher will provide an assessment of your child’s development. Any questions or problems may be discussed in a private one-on-one setting. In addition to these yearly conferences, a meeting with the head teacher may be requested at any time. Dress your child in comfortable play clothes. During the year, your child will be involved in many different activities, some messier than others. Please do not send your child in “NON PLAY” clothing. Accidents happen and we hate to see an upset parent due to spilled paint, etc. Play clothes and rubber soled shoes or sneakers are what we recommend. Keep in mind that there is mulch on our playground, and certain shoes, especially flip flops and sandals, are impractical for school. Please label boots, jackets, hats, gloves, etc. with your child’s name. Children who are ill should be kept at home. Children who have colds and cannot wipe their noses by themselves should stay home. We do provide boxes of tissues for everyone’s use around the room. Any child who has had a fever within the last 24 hours should remain at home as a precaution. Because all of our activities are hand’s on, it is very easy for children to spread their germs at school. If a child becomes sick at school, every attempt will be made to contact a parent or the person noted on the emergency card. A teacher will remain with the child who will be separated from the other children. The teacher and aides of PNS are trained in CPR should an emergency arise. No medications will be administered at school, with the exception of emergency action allergy medications. The head teacher will study each child’s health certificates making note of the allergies and/or specific health care needs. This will be posted in the classroom. Any needed emergency allergy medication will be clearly marked and secured. Staff personnel observing any signs of possible abuse or neglect will report these signs to the Director. The Director and Chairperson of the Board will investigate the suspected abuse or neglect and initiate reporting procedures with the Department of Social Services if appropriate. 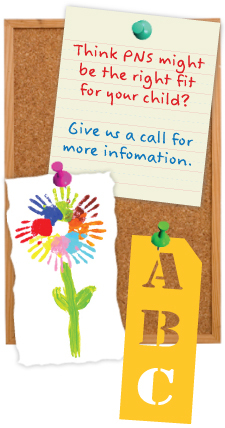 If your child will be absent from school, please call to let us know. you please keep all nut related foods and snacks for at home use. Simply check the nutrition/ingredient label before sending anything to school. If we feel any snack may be unsafe, we will simply send it back home and give your child a safe snack. This is an example of a lable for a snack that is NOT SAFE to send into school. Ingredients: Kashi Seven Whole Grains & Sesame® Blend (Whole: Hard Red Winter Wheat, Oats, Rye, Barley, Triticale, Long Grain Brown Rice, Buckwheat, Sesame Seeds), BROWN RICE SYRUP, CHERRIES (RED TART CHERRIES, APPLE JUICE CONCENTRATE), SEMI-SWEET CHOCOLATE (EVAPORATED CANE JUICE, CHOCOLATE LIQUOR, COCOA BUTTER, SOY LECITHIN, VANILLA), SOY PROTEIN ISOLATE, SOY GRITS, EVAPORATED CANE JUICE CRYSTALS, CHICORY ROOT FIBER, EVAPORATED CANE JUICE SYRUP, HONEY, CORN FLOUR, EXPELLER PRESSED CANOLA OIL, RICE STARCH, GLYCERIN, OAT FIBER, EVAPORATED SALT, NATURAL FLAVORS, MOLASSES, SOY LECITHIN, WHEY, ALMOND FLOUR, PEANUT FLOUR. CONTAINS CHERRIES AND MAY CONTAIN CHERRY PITS. Allergen Statement: CONTAINS WHEAT, SOY, MILK, ALMOND AND PEANUT INGREDIENTS. MAY CONTAIN OTHER TREE NUTS. Important: Cross contamination – snacks processed in a plant that processes nut products are not safe and are a danger to some children. Thank you for your cooperation. Since most food allergy emergencies occur at school, it is our responsibility to provide all of our students with a safe learning environment. Each child brings one small snack, and two drinks to school each day in a lunch box or bag. If we have duplicate lunch boxes, a sticker or ribbon tied on the handle will make identification easier for your child. The children are asked to wash their hands before eating. We encourage the children to eat politely and take care of their own personal needs when possible. Due to allergy concerns, children are never permitted to share their snack with another child. All the children will have lunch at school in addition to their snack. Due to the size of our class, we are unable to heat lunches. Please pack a lunch that is ready to eat. Also be sure to provide a beverage for both snack and lunch time. Water bottle should be small and easy to manage. We are happy to refill them here at school. Please do not send in huge adult size water bottles with a large hole. We like for all of our students to feel equally special on their birthdays therefore we celebrate each child’s birthday the same way. Birthdays will be celebrated at circle time. The birthday child will be given a crown. We will all sing “Happy Birthday”. That child will then be permitted to choose one birthday book from our birthday bag to borrow and bring home and return. Due to the new state regulations regarding food and allergies we ask that you do not send in treats or favors. We will celebrate all summer birthdays at the end of the school year with a “Super Summer Birthday Celebration”. It is a state law that each child be completely toilet trained before entering school. Especially early on in the school year, it would be helpful to dress your child in clothes that he/she can handle easily in the bathroom. The children use the bathroom on a “need to go” basis. An teacher escorts each child to the bathroom from the classroom. We do not enter the stall area with the child. Due to state regulations, we are unable to assist children in cleaning themselves. We do train the children, as you do at home, to wash their hands before leaving the bathroom. Several months into the school year, when we feel a child is independent enough to go to the bathroom and return himself/herself, he/she is permitted to go alone, but not before telling one of the teachers that he or she is leaving the room. The classroom door is left open until he/she returns. We will check on the child if he/she hasn’t returned in a reasonable amount of time. Each child should have an extra set of clothes in their backpack. We do have extra clothes available in case of an accident. Soiled clothes are bagged and sent home. Parents are reminded to launder the school clothes and return them as soon as possible. PNS participates in the “Clements Market Friend’s Fund”. Please save your cash register receipts and place them in marked envelope found on classroom bulletin board. We will use this savings towards a special school purchase. © 2019 Portsmouth Nursery School. All Rights Reserved.